This is another piece from Sam Seder’s Majority Report, presented by Michael Brooks. In this piece Brooks discusses the recent news that Rudy Giuliani, a senior Republican politicians and supporter of Donald Trump, has been paid for giving speeches to the Mujahidin-e Khalq. These were classified as a terrorist organisation, until Hillary took them off the register last year. Brooks gives a brief summary of their history and political orientation. They believe in a mixture of Islam and Marxism, and were one of the organisations involved the Islamic Revolution of 1979 and the toppling of the Shah. However, they fell out with the Ayatollah, and started fighting him. During the Iran-Iraq War, they attacked Iran from bases inside Iraq, even while Saddam Hussein was using poison gas against their fellow Iranians. They now have a headquarters in New York, and so have attracted speakers like Giuliani through the simple expedient of waving money at them. Brooks compares Giuliani’s endorsement of them to politicians giving their support to the Scientologists. He also makes the point about how hypocritical this is, by pointing out how the Republicans smeared Obama as being allegedly a Communist Muslim. This is important, not just because it shows the greed at the heart of Trump’s administration, but also the hypocrisy. Trump attacked Hillary for receiving money from speaking to Wall Street. He was right, but the Republicans are also receiving money from endorsing disgusting people and organisations. And just as Bush, Obama and Shrillary have supported Islamic terrorists in the Middle East to overthrow Assad, so Giuliani and the Republicans now believe it’s perfectly acceptable to support other Islamic terrorists, ’cause they want to overthrow the Iranian theocracy. These people are a danger to world peace, and specifically to the peoples of the Middle East. They’re corrupt, greedy corporatists seeking to get rich and bloated from the suffering of the powerless, both abroad and in America. They deserve nothing but contempt and the determined opposition of decent people. This is an extremely important piece from Jimmy Dore, the American comedian, who sometimes appears as a guest on the left-wing internet news show, The Young Turks. Dore is a consistent critic of American imperialism and its long history of overthrowing and destabilising the governments of poor nations around the globe, when they don’t bow down and surrender to American and Western political and corporate interests. In this video, he comments on a piece published by John F. Kennedy jnr in EcoWatch and Politics magazines. This article provides damning, point for point proof that the reason for the civil war and calls in the West for military intervention in Syria has nothing to do with humanitarian concerns. John Kerry, one of the main movers in this, isn’t interested or concerned by how many children have been killed or hospitals bombed by Assad. The real reason is what you might expect it to be, given the similar circumstances that were used to justify the invasion of Iraq. It’s all about the petrochemical industry. And in this case, it’s a natural gas pipeline, proposed in 2000 by Qatar. This would cost $10 billion and run for 1,500 km from Qatar, through Saudi Arabia, Jordan, Syria and Turkey. Another gas pipeline has also been proposed, which would run from Iran, through Iraq to Syria. These are both opposed by Russia. But they are most opposed to the Qatar to Turkey pipeline. Russia sells 70 per cent of its oil exports to Europe. Putin therefore regards this pipeline as an ‘existential threat’, a NATO plot to change the existing political and economic situation, deprive Russia of its only foothold in the Middle East, strangle the Russian economy and deny it leverage in the European energy market. Syria also opposes the pipeline. In 2009 Assad refused to sign the agreement allowing the pipeline to pass through his country in order to protect the interests of the Russians, who are his allies. The moment he made this decision, military and intelligence planners formulated a plan to start a Sunni uprising in Syria. Fore quotes another commenter, Cy Hersh, who states that before the war, Assad was actually beginning to liberalise the country. He gave thousands of files on jihadi radicals to the CIA after 9/11, as he viewed the jihadis as his and America’s mutual enemies. On September 13th, 2013, the American Secretary of State, John Kerry, told congress that the Sunni kingdoms in the Middle East – that is, countries like Qata and Saudi Arabia – had offered to pay for an American invasion of Syria to overthrow Assad. He repeated this statement to Representative Ileana Ros-Lehtinen, a Republican congresswoman for Florida. Two years before this, the US had joined France, Qatar, Saudi Arabia, Turkey and England to form the ‘Friends of Syria Coalition’, which demanded the removal of Assad. The CIA also paid $6 million to Barada, a TV company in Britain, to run pieces demanding Assad’s overthrow. Files from Saudi Intelligence released by WikiLeaks also show that by 2012 Turkey, Qatar and Saudi Arabia were training, arming and funding Sunni jihadists from Syria, Iraq and elsewhere. He also points out that this is the same policy America has adopted against nations the world over when they have refused to serve American interests. It’s particularly similar to the overthrow of the Iranian prime minister, Mossadeq, in the 1950s. Iran at that time was a secular democracy, just as Syria is a secular state. However, America was afraid of Arab nationalism, linking it with Communism. Mossadeq nationalised the Iran oil industry, which was previously in the hands of the West. So the CIA arranged a coup, which led to the Shah eventually ruling as the country’s absolute monarch. Until he was toppled in 1979 by the Islamic Revolution, which produced the Ayatollah Khomeini and the current Iranian regime that has been a bitter opponent of America ever since. Dore also states that it was known long before this that American intervention in the Middle East and elsewhere was turning the world’s peoples against America. He cites a report by Bruce Lovett in the 1950s which condemned American military interventions around the world as ‘antithetical to American leadership’ and moral authority, and noting that this occurred without Americans knowledge. In other words, as Dore points out, they don’t hate the US because America enjoys freedoms that they don’t possess. They hate America because America bombs and kills them. The people in those countries are well aware of what is occurring, but this is carefully kept from America’s own people. This is all too plausible. Dore’s own producers off-camera state that they’re not conspiracy theorists, but there’s nothing in this that is implausible given America’s foreign policy record. This is the real reason we have people in our own parliament, like Bomber Benn, demanding military action against Assad in Syria. It also shows, on a more philosophical level, how right Jacob Bronowski, the scientist and member of the Fabian Society, when he decried war as ‘theft by other means’. None of this makes Putin any less of a thug and a bully domestically. And Assad is also guilty of horrific human rights abuses. But those are not the reasons we’re being led into another war in the Middle East, and possibly with Russia. I can remember back in 1990 when Gulf War 1 broke out. There were protesters chanting, ‘Gosh, no, we won’t go. We won’t die for Texaco’. The Green Party denounced it as a ‘resource war’. They were right then, and I’ve no doubt whatsoever they’re right now. Our courageous young men and women should not be sent to die just to despoil another nation of its natural resources, and inflate the already bloated wealth of more petrochemical industry executives and oil sheikhs. And we definitely shouldn’t be doing anything to assist the Saudis, the very people who are giving lavish material aid to al-Qaeda and ISIS in order to export a viciously intolerant and brutal Islamism around the world through military force. And a little while ago I mentioned how the veteran British comics writer, Pat Mills, had put in a few satirical comments about the Gulf War in the ABC Warriors strip in 2000 AD. In the stories about the Volgan War, the robot soldiers recount how they fought in a war against the Russians, the real cause of which was to steal the Russians’ oil reserves after the world had past the tipping point. This was called by the Volgans/Russians the ‘Fourth Oil War’. Russia has indeed vast resources of oil and other minerals, which it exports around the world. And again, NATO forces are building up in eastern Europe, with NATO generals predicting that by May next year, we will be at war with Russia. It seems to me that Mills is right, probably more than he knew when he wrote the strip, and that the West really is pushing for a war to seize their oil. This may lead us all into nuclear Armageddon. Quite apart from being grossly immoral. As Hammerstein and his metal comrades say: ‘Increase the peace’. Kulinski in this clip discusses a report in the Guardian that a group of 40 newspaper and other media companies in Iran have clubbed together to raise the money offered under their government’s fatwa for killing Salman Rushdie by a further $600,000. The fatwas was imposed way back in 1988 by the leader of the Islamic Revolution in Iran, the Ayatollah Khomeini, for Rushdie writing the book, the Satanic Verses, which the Ayatollah considered blasphemous against Islam. Kulinski points out that it hasn’t just been Rushdie whose life has been put in danger by the fatwa. The book’s Japanese translator, Hitoshi Kirigashi was fatally stabbed in 1991. That same year, the Italian translator, Ettore Caprioli, was also the victim of a stabbing, though mercifully he survived. Aziz Nessin, the Turkish translator, survived an arson attack on an hotel in which 37 other people died in 1993. William Nyegard, the Swedish translator, was also attacked in 1993. He was shot three times in Oslo, though thankfully he too survived. And last year, 2015, Iran withdrew from the Frankfurt book fair because they had announced that Rushdie was speaking. I’m reblogging this as there’s much more going on here than simply a revival of anti-Rushdie feeling in Iran. In fact, the evidence points the other way. If these media companies have decided to band together to add even more money to the fatwa, then it shows very effectively that few people in Iran are interested in killing the author. Again, thankfully. The book has been a source of tension between Islam and the secular West almost from the first. Not all Muslims are as extreme as the Ayatollah, but many, perhaps the majority, do resent what they see as an attack on their religion. The book’s Islamic opponents have also pointed out that Viking Penguin was also ambivalent about publishing the book. The publisher’s advisors told them three time that it would result in serious trouble, including mass protests. These were eventually ignored and overridden. Roald Dahl, the renowned children’s author, speaking on Radio 4 several years ago, also felt that the book should not have been published given the hatred and violence that this had caused. He did not consider it great literature, and felt it should be pulped. The outrage caused by The Satanic Verses is also a major cause of the current surge of anti-western and Islamist Muslim activism. Outrage at the book prompted Muslims to band together for pretty much the first time in protest, organising demonstrations and book burnings. And the preachers of hate used it as a pretext to attack Britons and British society in general. I can remember Kalim Saddiqui speaking in his mosque on a documentary shown late at night on the Beeb, The Trouble with Islam, in which he described Britain as ‘a terrible killing machine’ and stated that ‘killing Muslims comes very easily to them.’ When the documentary-makers picked him up on this, he blustered that it was about the Satanic Verses, which had been published in preparation for a ‘holocaust of Muslims.’ He was, of course, talking poisonous rubbish. In fact all the people I know, who’ve actually read the book, tell me that it’s not actually blasphemous. I know a lecturer in Islam, who actually got his students to read the book when he was teaching in Pakistan. They’d been talking about how the book was blasphemous, so he asked them if they’d read it. When they said they hadn’t, he asked them if they would, and gave copies to them to read. They carried them home in brown paper bags so no-one would see them. When they’d read the book, he asked them again if they thought it was blasphemous. They said, ‘No’. There were very cynical, political reasons for the Ayatollah’s decision to put a price on Rushdie’s head. He was afraid he was losing Iran’s position as the premier Islamic revolutionary regime to others, like Colonel Gaddafi’s Libya. In order to try and whip up some more popularity, he resorted to that classic Orwellian technique: the five minute hate. This is the episode in Orwell’s classic 1984, where ‘Big Brother’ orchestrates a wave of hatred against a traitor figure for about five minutes. It’s very, very much like the way Stalin whipped up hatred in the Soviet Union against Trotsky, who was accused of all kinds of treachery and perfidy against the state and its people. Khomeini was doing the same here, but with Rushdie as the hate figure. 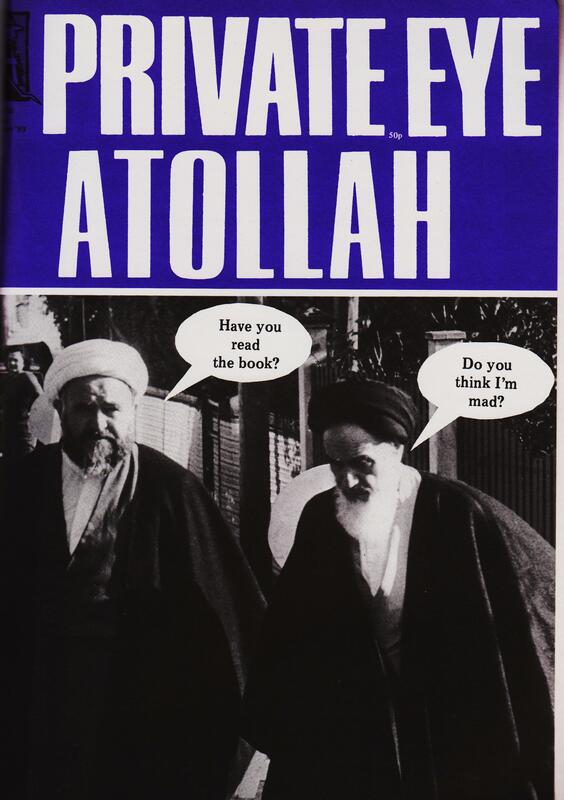 The fatwa didn’t work as well as the Iranians hoped it would, though I have Iranian friends who feel that the Satanic Verses was deliberately published by the British government to sever relations with Iran. After about a decade or more, the Iranians announced that, while the fatwa couldn’t – or wouldn’t – be lifted, they weren’t going actively going to enforce it. Then a few years ago, more money was placed on the price. This was after the rioting around the world against the film, The Innocence of Muslims, which was a genuinely blasphemous attack on Mohammed. The film, however, was the group of expatriate Egyptians and nothing to do with Salman Rushdie. Again, it looked like a cynical attempt by the Iranian revolutionary authorities to gain some kind of political advantage, which they felt they had lost. And now this. And everything about this says exactly the same to me: that this is nothing but a cynical attempt to exploit Rushdie’s notoriety to marshal support for the regime. Except that I don’t know how successful they’ll be. Not very, is my guess. They weren’t before, despite the vicious attacks on Rushdie’s publishers and translators. After all, they had to drop it as a dead letter for several years. And Kulinski is right about the Iranian population. They are on average very young. Most of the population is under 30. This generation doesn’t remember the Shah or the Islamic Revolution, and Rushdie to them is nothing but decades old news. Now I don’t share Kulinski’s atheism. I think that people have the right to bring their children up and have them educated in their faith, and I don’t see it as brainwashing. But I do share his feelings that if the Iranians are resorting to violence, or advocating it, then it does mean that they don’t have confidence in their own ability to confront and overcome Rushdie in the realm of ideas. Which is itself astonishing, considering the rich heritage of Islamic philosophy. But then, I don’t think combating Rushdie’s ideas are what the fatwas is intended for. As I said, I think it’s an appeal to raw emotion simply to bolster the regime. So why would the Iranian state and authorities need this renewed campaign against Rushdie? It might be because the young general is much less religious, and more secular. Atheism is expanding across the Middle East, including Iran. This is pretty much what you’d expect when religion, or indeed any ideology, becomes oppressive and the source of violence instead of peace and prosperity. Christopher Hill, in one of his books on what he called the English Revolution, his term for the British Civil War notes that the religious violence in Britain in the mid-17th century led to a similar growth in atheism and unbelief. And Iran many people resent their lack of political and social freedoms, and the immense corruption of Islamic clergy, who have enriched themselves through backhanders from commerce, industry and control of the bonyads, the religious trusts, which manage about 50 per cent of the economy, including the oil industry. All this growth in atheism is very, very clandestine. Atheism and apostasy are capital crimes in many Islamic countries, and so people have to be very careful about who they talk to about this issue. Even social media is very carefully monitored. ISIS in Syria kept the facebook and twitter accounts of a female anti-Islamist activist open long after the woman herself had been captured and murdered by them, as a honey trap to catch other anti-Islamist dissidents. And Nokia sold software across the Middle East to the despots and autocrats enabling them to hack into people’s mobiles in order to spy on them. So it’s still incredibly dangerous. Nevertheless, atheism and general disaffection against these regimes is growing. So I’m very sure that the Iranians have raised the fatwa bounty once again, because they hear the ticks of the clock sounding out the final moments of their regime only too well.